Congenital abnormalities of the lids occasion­ally occur. Ptosis is a drooping of the upper lid due to weakened muscles supporting the lid; this may involve one eye or both. Ectropion is a turning-out of the upper or lower lid, and entropion is an inversion of a lid. These may be due to scar about the lids which tend to contract and distort them; such scar may be from infections, injuries, or operations for re­moval of adjacent skin blemishes. These are cor­rectable by plastic operations on the lids. Infection of the edges of the lids is called blepharitis, a condition usually responsive to medical treatment. When an infection involves one of the glands along the edge of the lid and proceeds to pus formation, the condition is known as hordeolum or stye. Medical meas­ures with surgical incision for drainage are the means of treatment. Chalazion is a cystic enlargement of one of the lid glands by blocking of its opening. A small nodule within the lid becomes disfiguring but usually gives no other symptoms. Treatment is by elective operative removal. Tumors of the lids are not common and are essentially of the same variety as malignant and benign tumors of other skin-covered areas. Be­nign growths are removed for cosmetic reasons and malignant lesions demand immediate ex­tensive removal. To avoid disfigurement skin grafting may be employed. Injuries of the lids are common and neces­sitate repair and care as in other areas of the body, except that every effort to avoid perma­nent cosmetic disfigurement must be included. Extensive injuries may require plastic operative correction. After injuries and operations about the eye there usually results a collection of blood beneath the skin due to the lack of “tissue pres­sure” in the soft pliable tissue beneath the lids. This is known as hematoma, or ecchymosis, or “black eye.” Such blood is slowly absorbed in one to two weeks as the eyelids resume their normal contour. Conjunctivitis is any inflammation of the thin layer of conjunctiva which covers the front surface of the eyeball and the inner surface of the lids. This is the commonest affliction of the eye apparatus. Conjunctivitis may be due to specific germ infections, exposure to intense light, allergies, mechanical irritation of foreign particle “in the eye,” injury, or without obvious cause. Conjunctivitis may be acute or chronic. Treatment rests with elimination of the cause and local medications to alleviate the in­flammation. Chronic conjunctivitis may lead to the condition known as granulated lids. Inflammation of the tear duct system is called dacryocystitis, and may be acute or chronic. The acute involvement is more often by medical measures, but chronic dacryo­cystitis may require minor or extensive surgical procedures. Inflammation of the cornea of the eye is called keratitis, which gives rise to pain, interference of vision, and excess sensitivity to light. Treat­ment is usually medical. With aging there may be degeneration of the cornea, which begins at the outer surface and extends inward. This is visible on the surface of the eye and is called arcus senilis. Ulcerations and foreign particles imbedded in the cornea may result in scar for­mation. When these overlie the pupil, vision may be impaired. Corneal ulcers may result in mark­edly impaired vision as healing results in scar. Treatment of this condition is by corneal trans­plantation (keratoplasty), recently with mar­velous success. Transplants are taken from a fetus, or from a donor, or from the eye of a recently deceased person. More recently throughout this country “eye banks” are main­tained where transplants are available. With this procedure actual exchange of the structure is surgically accomplished. Postoperative rehabili­tation of the eye must be diligent as gradually strength and vision are regained. Scleral inflammation (scleritis) may occur spontaneously, but is not common, except after injuries and uncontrolled infections of adjacent structures. Treatment is usually medical. A bulg­ing of the eyeball at an abnormally weak area of the sclera is called staphyloma. Injuries of the sclera are serious on account of danger of injury to the inner layers, infections, and escape of the eyeball contents. Iritis is inflammation of the iris and fre­quently is associated with cyclitis (inflamma­tion of the ciliary body), the concurrent inflam­mations known as iridocyclitis. Treatment is by medical methods. Tumors of the iris are rare, but injuries may give rise to permanent deformi­ties which may distort the pupil (opening in iris) and impair vision. The choroid layer may become involved with inflammation, known as choroiditis. Several specific types occur with either acute or chronic course. “Die entire layer may be involved, or only a small area. Vision may be impaired. Treat­ment is medical. The thin delicate membrane most important to sight is the retina. This is actually an ex­pansion of nerve tissue from the optic nerve lining the eyeball. Here images are perceived and transmitted through the optic nerve to the brain for interpretation. Any involvement of this layer impairs vision. Inflammation of the retina, or retinitis, may be of several acute or chronic types. Treatment is most often by medical means. Circulatory changes, injuries, and toxic states may produce temporary or permanent visual loss. The retina may be examined directly by use of the ophthalmoscope. With this specially lighted instrument the examiner looks directly through the pupil into the eyeball. Retina, optic nerve, blood vessels, lens, and vitreous—all may be observed directly. 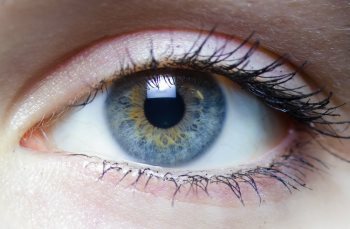 This is the only place in the body where the blood vessels may be seen directly and here they may be studied for eye disease or general circulatory disorders. Inflammation of the optic nerve is called optic neuritis. This may be acute or chronic, and often is associated with other body infec­tions, such as dental infections, sinusitis, nephri­tis, or any other localized or general infection. Vision is always affected. One or both eyes may be involved. In cases of increased pressure in the skull behind the eye (such as brain tumors and hem­orrhage), the optic nerve may become swollen and expressed; this is known as papilledema or “choked disc.” This disturbs vision and may be discovered by ophthalmoscopic examination, de­noting a serious underlying disease. Atrophy or degeneration of the optic nerve may result from infections and toxic states or with ageing. Visual loss is always permanent. Injuries of the optic nerve are usually associated with skull fractures and the immediate vision impairment is almost always permanent; later degeneration may ensue to hinder sight still further. Other than errors of refraction, the most com­mon involvement of the lens is the cataract, which is any opacity within this normally clear structure. Most commonly cataracts occur in the aged due to degenerative changes within the lens, the senile cataract. However, many other types occur as the result of nutritional or inflamma­tory changes, heredity, injury, x-ray exposure, poisons, and certain electric or heat exposures. In any type the major symptom is gradual dim­inution of the acuteness of vision. With the common senile type both eyes are almost always involved, but generally one in advance of the other. They rarely occur before the age of 50. On examination cataracts can be seen as cloud­ing or white opacities within the lens. Treatment of cataract is always by surgical removal. In some types only the cataract may be removed, but with the senile type, extraction of the lens is the only means of relief. Cataracts are generally progressive, becoming more and more dense and opaque. Operation to extract the cataract from the capsule of the lens can only be performed in the mature stage, when the cataract is said to be “ripe.” If operation is attempted before this stage, a small portion of the lens may be left so that a subsequent opacity develops (“after-cataract”). Usually iridectomy is accomplished at the time of cata­ract removal. The operation is usually done un­der local (topical) anesthesia. After-care most often includes several days of bandaging and rest. Favorable results with useful vision almost always follow cataract extraction. The vision is generally good and often perfect.